(Nanowerk News) With the aid of terahertz radiation, Munich physicists have developed a method for generating and controlling ultrashort electron pulses. With further improvements, this technique should be capable of capturing even electrons in motion (Science, "All-optical control and metrology of electron pulses"). Pulses of electrons (green, coming from the left) impinge on a micro-structured antenna which is powered by laser-generated terahertz radiation (red). The interaction compresses the duration of the electron pulses to a few femtoseconds. (Image: Christian Hackenberger) Seeing how atoms and electrons in a material respond to external stimuli can give scientists insight into unsolved problems in solid-state physics, such as the basis for high-temperature superconductivity and the many intriguing properties of other exotic materials. Short pulses of electrons can be used to image such responses. Due to their quantum mechanical wave-like properties, when electrons are scattered off a crystal, they interfere with each other to create a diffraction pattern. By recording these patterns, researchers can work out the atomic and electronic structure of the material, resolving details smaller than the size of an atom. Short electron pulses are, however, difficult to generate, because electrons carry a charge and move more slowly than the speed of light. In particular, electron pulse technology still has a long way to go to achieve the temporal resolution required to capture the motions of electrons inside a material. Now, a team headed by Dr. Peter Baum and Prof. Ferenc Krausz from the Laboratory for Attosecond Physics (LAP), LMU and the Max-Planck Institute of Quantum Optics (MPQ) has succeeded in developing a new technique for controlling ultrafast electron pulses. To date, microwave technology has been used to control electron pulses. Now, the LMU and MPQ researchers have - for the first time - used optically generated terahertz radiation. Using this technique, the team was able to reduce the length of the electron pulses significantly. Moreover, the method has the potential to visualize not only atoms, but also electrons in motion. Observing atoms and their motions requires highly specialized techniques. Electron microscopy and electron diffraction can provide the spatial resolution to image atoms, but filming atomic motions requires ultrashort shutter speeds - the shorter the electron pulses, the sharper the images from the microcosmos. Electron pulses with durations in the femtosecond to attosecond range (10-15-10-18 s) would be ideal for monitoring processes inside matter with the required resolution in both space and time, i.e. in four dimensions. While it is already possible to generate extremely short light pulses with lasers, optical pulses do not have the short wavelengths required to make atoms or charges in molecules and solids directly visible. Electrons are superior to light in this context, because their wavelengths are 100,000 times shorter. However, generating short pulses is much more difficult to do with electrons than with light. This is because electrons, unlike photons, have both rest mass and charge. Like visible light, terahertz radiation is a form of electromagnetic radiation. The wavelength of terahertz radiation is much longer, however, falling in the range between microwaves and infrared light. The researchers directed the pulsed terahertz radiation and the electron beam onto a special antenna, where the electrons and the terahertz photons can interact. They oriented the electric field of the terahertz radiation so that electrons arriving earlier were slowed down, and electrons arriving later were accelerated. Under these conditions, as the electron pulse continues to propagate, it is compressed, reaching a minimum duration at the location where it scatters from the material sample under study. Furthermore, the researchers can actually determine how long the electron pulses are when they arrive at the sample position. This involves forcing the electron pulses to interact a second time with terahertz radiation, but this time the terahertz electromagnetic fields are oriented such that they impart a sideways deflection to the electrons. Crucially, the extent of the deflection depends on the timing of the electrons’ interaction with the terahertz pulse. 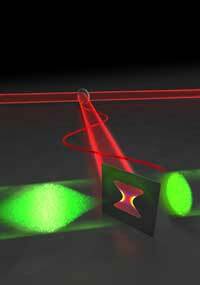 Hence, the physicists have created a virtual terahertz-stopwatch for the electron pulses. The new technology puts Baum and colleagues in a position to shorten the electron pulses even more. That will enable them to record ever faster atomic and eventually electronic motions. The aim is to track the attosecond motions of charged clouds in and around atoms in order to better understand the fundamentals of the interaction between light and matter. Such insights may eventually lead to new kinds of photonic and electronic materials and devices, driving the technologies of tomorrow.